Videogames come in all shapes, sizes and genres. They appeal to different types of gamers with different types of tastes. But when it all comes down to it, the game is about having fun. And when a game can offer co-op so both you and your buddy can have fun together, well then that's even a bigger bonus. A great example of this is Earth Defense Force, where the fun is put in front of production values or story. 50 Cent: Blood on the Sand is one of those games that transcends the bounds of what it is, and becomes what it is to play it. The game drops 50 Cent and his G-Unit smack in the Middle East after putting on a concert. But when the promoter tells Fitty that he lost his money, well that just wasn't going to fly with the crew. Thankfully, the promoter happened to have a diamond-encrusted skull laying around his pad as substitute payment. Just when you think Fitty and his crew can call it a night, they are ambushed by terrorists and his skull is stolen. If there's one thing terrorists need to learn, it's that you don't cross a rapper from Brooklyn who was shot seven times and survived. Quick Fitty - there's a poster of you! Blood on the Sand feels like an arcade game; its lightning fast gameplay, fancy score graphics, pop-ups and wave after wave of enemy grunts help it follow the Halo rule of gaming - 60 seconds of fun over and over again. 50 Cent baked a gaming cake that used batter from Gears of War, The Club, Stranglehold, and Barbie Horse Adventures. Ok, so I made the last one up, there's no ponies, but Blood on the Sand really does have a nice mix of gameplay that never seems to get old. The scoring system keeps things fresh with mini-challenges and multipliers for quick and successive kills. Throw in a counter kill, the game's hand-to-hand combat quick time event, and you'll be seeing more numbers than a Powerball lottery judge. The final way to bolster your score is to find the hidden posters and targets scattered throughout the levels. The wild ride through the Middle East is, of course, best experienced with a friend. Players can choose from the rest of the G-Unit crew to watch Fitty's back. Not only will they help headshot an enemy, blow up a vehicle, or man a minigun on a helicopter; but they'll provide meaningful comments on the local culture or architecture. No, I'm not joking. You'll work together to achieve the best possible score and awarded medals for the levels, unlocking more and more content. Thankfully terrorists like to keep their pockets stacked full of cash, and their crates full of bling; you'll use your newfound wealth to buy guns, counter kills and taunts, all of which are persistent from game to game. 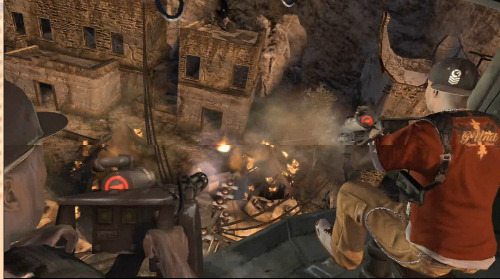 Players will find pay phones throughout the level where they can buy and switch weapons at any time, which in a way adds some strategy to situations. Before you know it, Fitty, skull in hand (I hope I didn't ruin it), rolls back to his rapping career. It's a short game - taking co-op players five to six hours to complete, but there's a ton of replay value thanks to the score/medal system and a wealth of unlockable material that will keep both gamers and Fitty fans busy. Upon completion, both my partner and I immediately said, "Wanna play through it again on hard?" The Co-Op Experience: Play as 50 Cent or a member of the G-Unit. 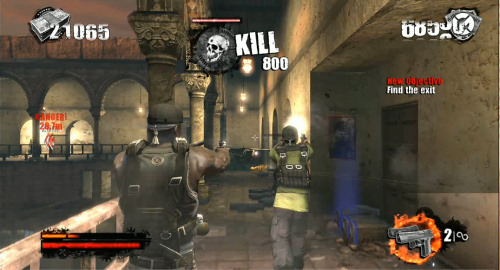 Players buy guns, upgrades, finishing moves and taunts as they earn points and combos from working together to kill off enemies. This Week In Co-Op: Family Bonding, G-Unit Style. A few More Grains through the Hour Glass, Blood on the Sand Delayed?